AMBERSTONE M08S refines radial comfort with bias strength through a ‘Dual-Carcass’ casing design to provide longest service life in high duty cycle operations. The optimized construction makes it competent to high torque and heavy load requirement commonly seen in container handling applications. 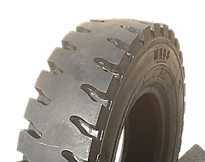 Excellent tread life and operator comfort.